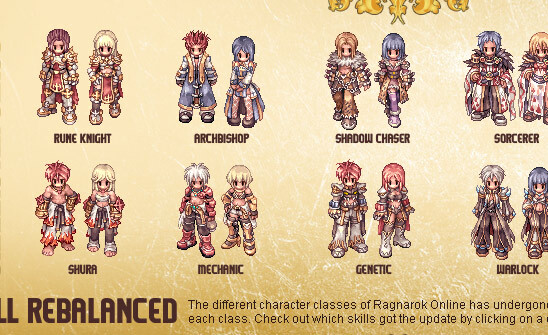 Check out the patch notes from the latest episode from the uber popular grand daddy MMORPG in the Philippines, RO PH Ragnarok Online Episode 26: Revolution. Balik RO!!! o	Changed from single target to self targeted. o	Increased damage formula is changed. o	Casting time is changed. o	Damage formula is changed.
? Duration is changed (300s -> 180s).
? Using the rune stone will enchant your weapon. On your next physical melee attack, you will auto-cast Crush Strike, and then the effect will be removed.
? When used, it recovers and protects against status effects for 60 seconds.
? HP recovered when using the runestone is 25%.
? For the duration of the skill, the physical and magic defense increase is affected by JobLv and Rune Mastery Level.
? Duration has changed (300s -> 180s).
? Storm blast damage formula changed. o	Skill range is changed (4 + SkillLv cells). o	Can now be used in siege. o	Damage formula is changed (Damage is now increased by users BaseLv, Agi, and JobLv). o	The HP cost when using the skill is changed. o	Damage dealt is now increased by your BaseLv. o	At level 5 the area of effect increases from 3×3 to 5×5. o	Skill range is increased (8 + SkillLv cells). o	Damage formula is changed (Damage is now increased by BaseLv and AGI). o	The success rate is increased. o	When using poison smoke, you no longer lose the poisoning weapon effect. o	SP cost has changed (280/320/360). o	Based on your job level, it can add an additional 1 ~ 5 Str/Int/Dex. o	SP cost is changed (200/220/240). o	Based on your job level, it can add an additional 1 ~ 5 Agi. o	The amount of HP healed increases with more party members. o	Skill cooldown time is changed. o	SP cost is changed (80 + SkillLv * 10). o	The defense power of the barrier is increased with more party members. o	Now also removes Burning, Freeze (Frost Mist) and Diamond Dust status effects. o	Skill success rate is increased. o	Now also removed Howling of Mandragora and Deep Sleep status effects. o	Now also removes the Critical Wounds status effect. o	Changed from self targeted to self and other players. o	Skill cooldown time is decreased. o	Skill cancellation conditions have changed.
? Before: Struck with ghost element magic damage.
? After: Struck with ghost element damage. o	Can now be cancelled with the Priest skill ‘Status Recovery’. o	SP cost is increased (80 + SkillLv * 20). o	Skill duration is changed (30 + SkillLv * 30 seconds). o	SP cost is changed (400 + SkillLv * 80). o	Skill fixed cast time is changed. o	Global cooldown is changed. o	If there is a warlock party member nearby (7×7), then comet will deal max damage to all targets in range. o	The amount of damage increases with each chain hit. o	Skill range is changed (3 cells -> 6 cells). o	Skill duration is changed. o	Skill variable cast time is changed. o	Skill reuse delay is removed. o	Damage formula is increased. o	Success rate is changed. o	Skill changed to use elemental ‘point’ items. o	Burning chance is increased. o	Freezing chance is increased. o	Duration time is changed. o	Skill changed to consume elemental ‘point’ items. o	Skill consumption of catalysts is increased. o	Damage now scales with the users BaseLv. o	Debuff chance is decreased. o	Range is changed (3 cells -> 3/4/5 cells). o	Now also removes the following buffs: Gentle Touch: Convert, Gentle Touch: Revitalize, Reflect Shield, Defender, Reflect Damage, Prestige, Banding. o	Now deals damage in a 3×3 cell area. o	SP cost is changed (40/50/60 sp). o	Variable casting time is changed. o	Skill range is changed (9/11/13 cells). o	Now allows you to ignore the effects of Fire Walk, Electric Walk, and Vacuum Extreme. o	The defense bonus is increased. o	Overheat limit is changed (From 100 -> 150). o	Fixed cast time is changed. o	Variable cast time is changed. o	Now consumes 3 Mado fuel. o	Skill now no longer has an SP requirement to cast. o	The fuel cost of the skill is changed from 2 to 1.
o	The Overheat Point decrease by the cooling device is changed. o	Skill fixed cast time is removed. o	Skill success rate is now 100%. o	Players that were detected will have their evasion lowered for 5 seconds. o	The fuel cost of the skill is changed from 3 to 2.
o	Skill area of effect is changed from 3×3/5×5/7×7 cells to 5×5 cells fixed. o	The SP drain is now fixed 50 per second. o	Earth element damage and quagmire will cancel Magnetic Field. o	Skill variable cast time is removed. o	Skill reuse delay is now 90 seconds. o	Skill area of effect is changed from 3×3 cells to 5×5 cells. o	SP cost is changed (80/100/120). o	Variable cast time is removed. o	Skill reuse delay is changed. o	Skill area of effect is changed (3×3 cells -> 5×5 cells). o	The SP cost over time is changed (3 seconds 1% / 4 seconds 1% / 5 seconds 1%). o	Ranged damage reduction is changed from 30% to 20%. o	Item consumed by the skill has changed. o	The HP recovered by the skill is changed. o	Skill SP cost is changed. o	Detecting skills will no longer cancel Invisible. o	No longer affects boss type monsters. o	Can only be used on Siege maps and PVP enabled maps. o	Now only affects you or your own party. o	No longer caused provoke status, but berserker status. o	Skill effect has changed to hide you before performing the backstep. o	Skills copied through reproduce now have twice the SP cost. o	Detecting skills have a chance to cancel Shadow Form. o	Success rate is decreased. o	Changed to only work when used with short ranged attacks. o	The reflect rate is changed. o	A number of reflect limit is added. o	SP cost is changed (80/100/120/140/160). o	The SP drain while active is changed. o	Changed to only reflect short ranged attacks (will not reflect trap damage). o	SP cost is changed (30->50). o	SP cost is changed (20/32/44/56/68). o	SP cost is changed (32/44/56/68/72). o	SP cost is changed (60/65/70/75/80). o	SP cost is changed (80/90/100/110/120). o	The amount of bonus stats is changed. o	The amount of bonus attack power is changed. o	The skill requires 1% experience in order to cast. If you do not have that experience, you cannot activate the skill. o	Deals additional damage when cast as part of a combo. o	Activation rate is changed. o	The bonus knockback damage is changed. o	Duration time has changed. o	Casting time and skill reuse time are increased. o	Skill reuse time is changed. o	HP recovery amount is changed. o	Max HP decrease amount changed. o	Consumes an amount of spheres equal to skill level used. o	Consumes an amount of spirit spheres equal to skill level used. o	Max HP increase changed. o	The bonus defense gained is changed. o	Fixed casting time is changed (1s/1.5s/2s/2.5s/3s). o	The bonus attack speed is changed from being based on your JobLv to your level of Lessons learned. o	Magic attack power increase formula is changed. o	Physical attack power increase formula is changed. o	The limit to the number of reverberations you can place is removed. o	Can now be cured by the priest skill ‘Status Recovery’ and the Sura skill ‘Lion Howl’. o	Can no longer be placed at a target’s feet. o	Skill success rate is changed. o	Changed to be self targeted. o	Area of effect is changed (11×11 / 13×13 / 15×15 / 17×17 / 19×19). o	The targets stats can lower the success rate. o	Deep sleep can be cancelled by the Bishop skill ‘Lauda Ramus’, Sura skill ‘Lion Howl’ and Wanderer/Maestro skill ‘Sound of Destruction’. o	Can only be cast on yourself or your party members. o	Can only be used on PVP enabled maps. o	SP cost is changed (60/75/90/105/120). o	Evasion decrease rate changed. o	Attack speed decrease rate changed. o	When using the skill, has a low chance to halve movement speed, and cause the target to dismount from their Dragon/Gryphon/Pecopeco. o	Now improves the rune knight skill ‘Hundred Spear’. o	Damage amplification formula is changed. o	For each wanderer/minstrel in party above 2, deals additional damage. o	Damage formula has changed. o	For each wanderer/minstrel in party above 2, increases sp recovery rate. o	For each wanderer/minstrel in party above 2, increases the attack power and attack speed of Rangers and increases the bonus Warg attack damage. o	Skill reuse time is increased. o	Changed from around a single target to ground targeted. o	Skill area of effect is changed (9×9 / 9×9 / 11×11 / 11×11 /13×13). o	Any bard or dancer based skill effect will be cancelled. o	Targets that have effects cancelled will take damage. o	Targets that have effects cancelled will have a 100% chance to be stunned. o	Can only be used on PK enabled maps. o	Enemies in range will immediately lose SP and have their int decreased. o	Enemies will have their MaxHP lowered, but in exchange gain higher STR and Critical Rate. o	Skill reuse delay is changed (110/120/130/140/150 seconds). o	Skill bonus damage is changed. o	No longer affects mechanics using magic gear. o	Bonus weapon damage is changed ((SkillLv*2)+8) * WeaponLv. o	Changed to ground targeted, ranged changed to ( 3×3 / 3×3 / 5×5 / 5×5 / 7×7 ). o	Agni(Medium) Passive mode [Heater]: Psychic Wave becomes fire element, Psychic Wave sp cost increases by 1.5 times. o	Aqua(Medium) Passive Mode [Cooler]: Psychic Wave becomes water element, Psychic Wave sp cost increases by 1.5 times. o	Ventus(Medium) Passive Mode [Blast]: Psychic Wave becomes wind element, Psychic Wave sp cost increases by 1.5 times. o	Tera(Medium) Passive Mode [Cursed Soil]: Psychic Wave becomes earth element, Psychic Wave sp cost increases by 1.5 times. o	Max number of placeable traps changed. o	Can no longer be placed at a targets feet. o	Can no longer be stacked on or near other thorn traps. o	Can now be used in siege mode. o	Area of effect changed (11×11 / 13×13 / 13×13 / 15×15 / 15×15). o	Cooking success rate changed. o	Number of items made per cooking changed. o	Bomb creation success rate changed. o	Number of bombs created per attempt changed. o	Base success rate changed. o	Causes 100% chance to be silenced, but will remove some other status effects. o	Effect of level 1 and 2 are changed. o	Damage formula is lowered. NOTE: The information posted above is for reference purposes only. Actual game setting may vary and dependent on current game settings.